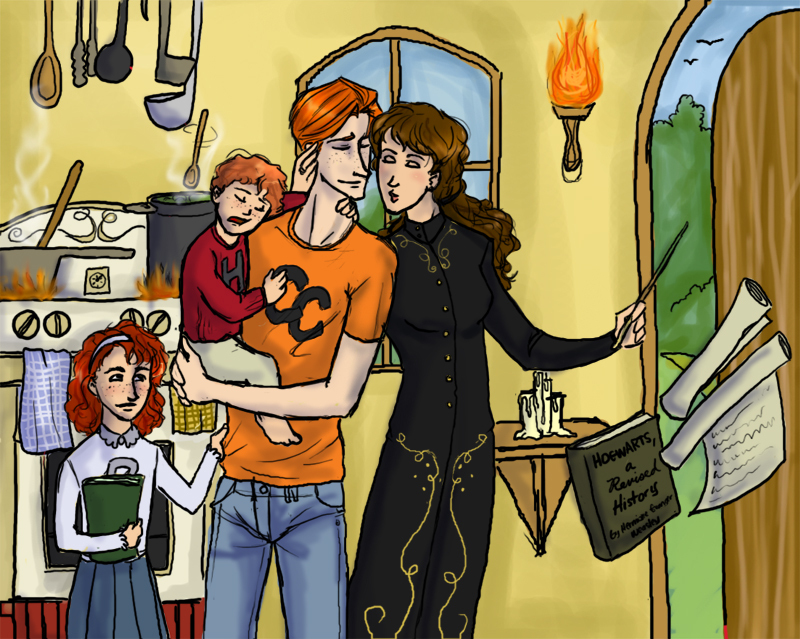 DH The Granger-Weasley Family. from left to right: rose, hugo, ron, hermione I don't know who this is. I'll tell you this... It wasn't me.. HD Wallpaper and background images in the romione club tagged: hermione ron romione image fan art harry potter family dh. from left to right: rose, hugo, ron, hermione I don't know who this is. I'll tell you this... It wasn't me. Sorry i can't remember who wrote it. Author's comments: The Granger-Weasley family (because you know Hermione kept her last name), a few years before the epilogue. In my mind, Ron works for the ministry once everything has been squared away now that Voldemort's dead, maybe Muggle Relations or something. But, primarily, I love thinking that he's a stay-at-home dad, and learned a whole bunch of domestic spells from his Mom, and Hermione still can't cook. Hermione is the bread-winner, a magical historian or something concerning wizarding law, and has so far published “Hogwarts, A Revised History” and “The History and Future of House Elves” or something like that. And of course, Rose and Hugo, who Ron probably affectionally dubs "The Midgets." i think they ought to have a bigger family so me and a friend devised this, in order:Kim&Mike(twins,HATE each other),Patrica&Cynthia(love everyone very smart and magically gifted),Bridgette(the all round middle child of the family very book smart),Remus (almost the only boy in the family the real sweetey can always get m&k to stop fighting),and Gabey (the baby of the family very bossy always gets her way!). This picture belongs to Hilary CW from Deviantart.com ;) Very sweet! Aww! So cute! And they needed that revised edition, after all that happened in the battle. *sob* the midgets, that's hilarious! !